The fourth Summit of the Bay of Bengal Initiative for Multi-Sectoral Technical and Economic Cooperation (BIMSTEC) has concluded by endorsing the 18-point Kathmandu Declaration on Friday. Prime Minister K P Sharma Oli has said prosperity among BIMSTEC member nations is possible through combined efforts and collaborations among all the member states. BIMSTEC could be the much-needed platform for boosting Nepal’s presence in regional and world affairs and for paving way for securing long-term economic growth. Hosting of summit has provided the incumbent government much-needed credibility in pulling things together. We have achieved much more. One of the major achievements of the summit is putting the nation back on the international arena as a country that is open for serious business. With this we have recovered Nepal’s reputation that was tarnished during the Maoist insurgency and the instability of the post-conflict era. The summit has sent a clear message to the world that Nepal is a stable and secure destination for investors and its development partners. Starting with our closest neighbors, we are gradually improving bilateral relationship with our regional and world allies. BIMSTEC, as such, is an important step toward this initiative. Regional organizations, like this one, cannot function without full willingness of all its member states. Presence of the heads of the states of member states in Kathmandu was an example of this. By organizing the summit of this scale with heads of states and governments of seven prominent nations of South Asia and South East Asia, Nepal has showed its matured diplomacy. Active diplomacy exhibited by Foreign Affairs Minister Pradeep Kumar Gyawali, Prime Minister Oli and active support of former Prime Minister and Chairman of Nepal Communist Party, Pushpa Kamal Dahal, have been vital in bringing all the actors together for making this summit happen. Since assuming office, PM Oli has engaged in multiple productive meetings and discussions with his counterparts from our neighboring countries. Indian Prime Minister Modi was in Kathmandu for the fourth time and this shows how well Oli-Modi chemistry is working. Because of their active participation and willingness, they have achieved more than any governments in revitalizing the centuries-old bilateral relationship between the nations. This is an example of two statesmen working on building and furthering a purely functional relationship with a personal touch. 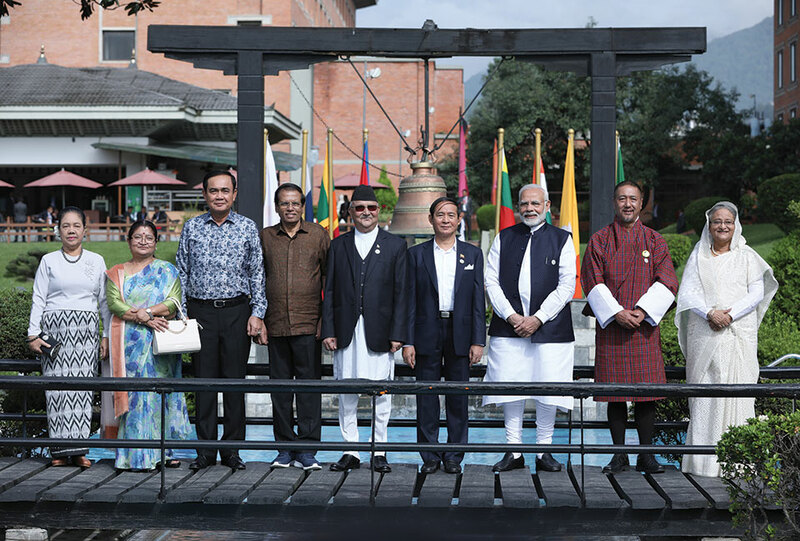 Prime Minister Oli has extended his charm offensive further by holding discussions with the visiting heads of BIMSTEC members. To fulfill his goal of economic growth, PM Oli needs friends who share the same vision and are willing to become partners. Each BIMSTEC member state has common interests—promoting connectivity and agriculture, fighting climate change and terrorism, poverty alleviation, promoting energy, fisheries, technology, trade and investment, tourism, transport and communications, cooperation on prosperity and development among many others. Discussions held in Kathmandu will be crucial in realizing these goals. Political instability and directionless foreign policy had rendered Nepal as a silent member among the comity of nations. For a nation to further its existing relationship or build new one, it should have a foreign policy that clearly charts out its focus area and communicates its objectives and goals with the pool of its diplomats. The incumbent government has all the means to achieve this. The connectivity mantra of BIMSTEC is Nepal’s need today for achieving its goal of economic prosperity and getting rid of being land-locked. The Kathmandu Declaration is a significant step toward realizing this goal. Transport is the backbone of trade and commerce. We should be able to work with member states of BIMSTEC to further our interests in building new transportation links with them and opening new avenues for trade with the world, while improving the existing ones. The summit discussed exploring new opportunities for establishing air, water and land connectivity routes with the member states. If we can translate this in reality, it will play pivotal role in expanding our market reach for our products and in paving way for foreign investors to invest in Nepal. Indian Prime Minister has already expressed willingness to extend support for Oli’s vision of connectivity by extending Indian railways and water linkage up to Nepal. Signing of Raxual- Kathmandu DPR by Prime Minister Oli and his Indian counterpart Modi on the sidelines of the summit is a major achievement for the nation’s transportation sector and, if implemented, the vision of greater connectivity will move toward realization. Buddhist and Hindu shrines across the country receive a great number of tourists from the BIMSTEC members annually. We share common cultural and religious interests with the member states. We have great scope for nature and religious tourism. If we can build the required infrastructure and formulate policies that support the private sector for investing in hospitality tourism, we could also establish ourselves as a leader in tourism industry. During his previous visit, Modi had visited Janakpur and Mustang—two of the most prominent religious sites in Nepal. This time, he along with Prime Minister Oli, jointly inaugurated one of the biggest dharmshalas in Pashupatinath temple premises. Such gestures will play important role in promoting religious tourism. While the summit has raised some hopes, there is a lot for Nepal to improve to establish the country as a world class tourist destination. If we continue to patch potholes on the roads just a few hours before a dignitary rides on it, it’s not going to send a positive message to the visitors. Nor can we become the top tourist destination. Nepal, so far, has remained largely isolated from the world because of continuous internal political wrangling. PM Oli and his team have successfully used the summit to connect the country with the nations that share our vision of development and prosperity. Now is the time for them to march ahead breaking down the shackles that held our country back. BIMSTEC member states have unanimously expressed commitment for implementing the Kathmandu Declaration. If each member sincerely works together to effectively implement the declaration in letter and spirit, BIMSTEC will surely be established as one of the most prominent regional organizations in the world.